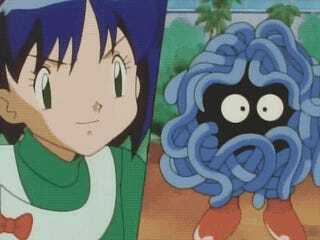 It's Tangela, the...sphagetti Pokemon? The...tumbleweed Pokemon? The...vine Pokemon! Yes, that's it! This little fella is brought up when people argue that gen 1 was housing horrible designs, and I'm not sure where I stand when it comes to that thought. On one hand, it's simple enough to be considered "lazy", but I also see it having quite a unique set up. I think anyone who doesn't really like Tangela do not see the elements of what makes him interesting and different from the others. Just don't talk to me about Tangrowth. And I think that's what's most important to me when it comes to diversifying the ecosystem of the world we've come to know and love. Tangrowth is just more of the same. Instead, it should have focused on revealing what Tangela was, or explode in a major way with the route they took with the vine Pokemon. So yeah, we're not really sure what Tangela is - he's just kinda walking around with eyes poking out from deep within the mess of vines that adds a shroud of mystery around the little critter. How I began to tackle Tangela was in a way unlike what we see here in this final result that I very much enjoyed creating. A while back, I mentioned I tried style that looked like a child's scribble - I thought it would be a perfect art style to use for meeting the challenge of this series on a Pokemon that was very simple to illustrate. I failed to use it on Bellsprout, and when I got to Tangela, I realized I could use it here. I tried several concepts of just scribbling all over my canvas with a crayon textured brush but found no luck in coming up with anything decent. It would come out to look more modern-arty than a child's representation. I gave up after 3-4 tries and decided to just go all out. 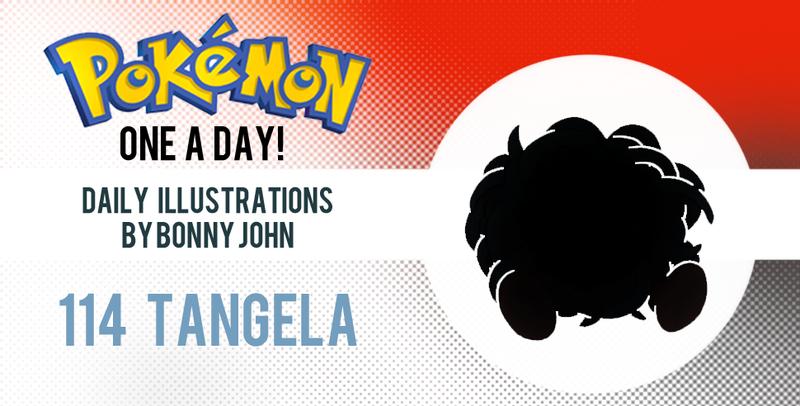 Do the exact opposite of something simple in execution - I wanted a Tangela that would look motherf! @#(ing tangled the @(*#f up. I started to draw in squiggly vines until I got a circular shape. I soon filled in the tentacles rather slowly, assigning colors very carefully - as you'll notice, the color set up here is different from the usual Tangela. For some reason, Tangela's vines are blue and not green. I guess that's kinda cool but I decided to vary it up to between blues and greens to make the character look more floral. On top of that, it just makes it look more lively as if multiple species of flora are jumbled about to make the form. I eventually made a second layer of squiggly tentacles that I colored in and then darkened the layer below to create sense of depth. Eventually I painted in darks to push in and bring out the slithering vines. As you can see, the middle of Tangela's opening features no linework - instead the vines are rendered out. As the vines push out, they take on lines and feature vines that are slightly rendered or colored flat. This creates chaos that adds to the madness that is the mess of Tangela's "body". As you can see, I removed Tangela's shoes because...well, they're pretty stupid. How is this creature supposed to be so damn tangled up but he somehow got some Air Jordans on his feet and can walk without tripping? I made the whole bloody thing a sphere of tangles and my version of Tangela rolls about to get around. It can also create "hands" and "legs" to walk or manipulate objects in a manner fitting for the situation. The final key to the puzzle was throwing in some red eyes for Tangela. The creature is a mystery to us, so why not make things interesting? I took the red of the shoes and gave the create an intimidating stare...Well, intimidating for a Tangela! The sideways glance is kind of cute, isn't it? So there you go! A bustling Tangle that started out supposed to be a children's drawing into a clean work of organized chaos! I'm happy with how the colors came out and hope you enjoyed today's work. Thanks for reading today's write up and for sharing your support. Enjoy your weekend and we'll link up again come Monday, so see you then!